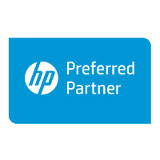 Game-changing educational technology within reach—through our personalized financing options. Budget constraints can make new technology seem out of reach. 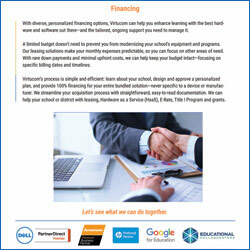 With diverse, personalized financing options, Virtucom can help you enhance learning with the best hardware and software out there—and the tailored, ongoing support you need to manage it. We understand your financial concerns, including funding, leasing, and time-sensitive paperwork like Title 1 and grant applications. Virtucom takes all of these into account—along with separating your capital and operating expenses—to help you overcome any financial obstacles. A limited budget doesn’t need to prevent you from modernizing your school’s equipment and programs. Our leasing solutions make your monthly expenses predictable, so you can focus on other areas of need. With rare down payments and minimal upfront costs, we can help keep your budget intact—focusing on specific billing dates and timelines. Virtucom’s process is simple and efficient: learn about your school, design and approve a personalized plan, and provide 100% financing for your entire bundled solution—never specific to a device or manufacturer. We streamline your acquisition process with straightforward, easy-to-read documentation. With three-, four-, and five-year terms, we get you the lowest possible rates through one dollar buyout or fair market value leases. Similar to licensing, we install your new technology onsite and replace outdated hardware and software with updated versions when you renew your contract. Through the federally funded E-Rate program, Virtucom provides eligible schools and libraries discounted educational technology services. To meet the needs of eligible districts, we ensure low-income students access to educational technology through the U.S. Department of Education’s Title I Program. When your technology needs exceed your resources, we can help you apply for a digital learning grant—making integration possible without disturbing your budget. To learn more about our affordable financial consulting and options, please contact us today.